This post was sponsored by Nature's Path. All thoughts and opinions expressed are my own. Thanks for supporting brands I love that make this blog possible! Gahhhh just look at that creamy bowl of oats! I honestly want to take a bath in there! 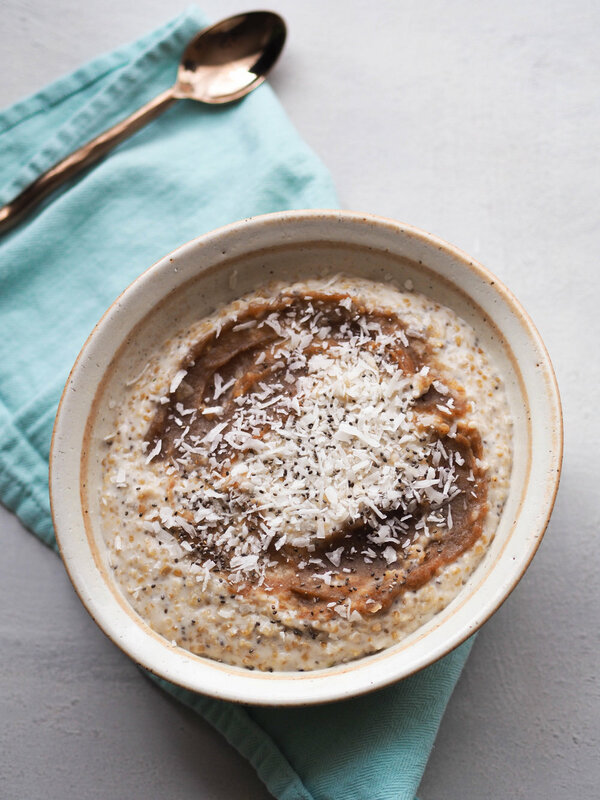 I'm so excited to share the recipe for my coconut ginger date oatmeal, which I made with Nature's Path products, one of my favorite brands selling delicious organic foods. In this new year stretch, there's a lot of people trying to make changes to their eating and lifestyle habits, either by setting resolutions, intentions, or goals. 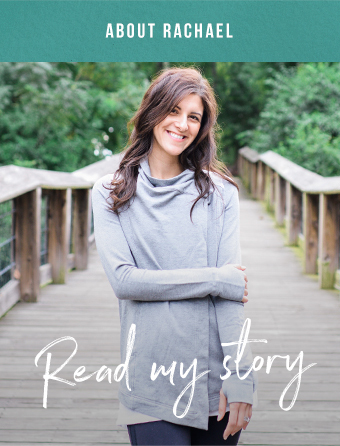 I've talked a lot about why weight loss resolutions or grandiose resolutions don't stick, but something I haven't talked enough about is the intentions behind behavior changes. Often times, people try to make eating changes out of fear, usually fear of gaining weight or fear of disease. But changes rooted in fear rarely stick - and also have the tendency to get a bit out of control. It's fear that turns healthy behavior changes into unhealthy restriction. Organic food is a great example. A lot of people go all in on organic food out of fear, needlessly spending hours and hours in the grocery store, giving up favorite non-organic foods, and going over their food budget. It's exhausting, and pretty unsustainable. There's tons of great health and environmental reasons to purchase organic, but fear of conventionally grown foods isn't one of them! Instead, I like to focus on choosing more organic foods because it's good for the environment, which is something I care deeply about. Supporting organic farming means less chemical fertilizers in the environment, and that my food dollar is going to farmers practicing more sustainable practices. It's not an all or nothing thing, but when I find an organic food company that makes budget-friendly products that taste great, I'm excited to support them! So if you're thinking about making changes in this new year, don't try to change yourself (you're already pretty great! ), but think about something positive you can do for yourself or the world - or both by purchasing more organics! One organic food I always have on hand are Nature's Path organic oats. 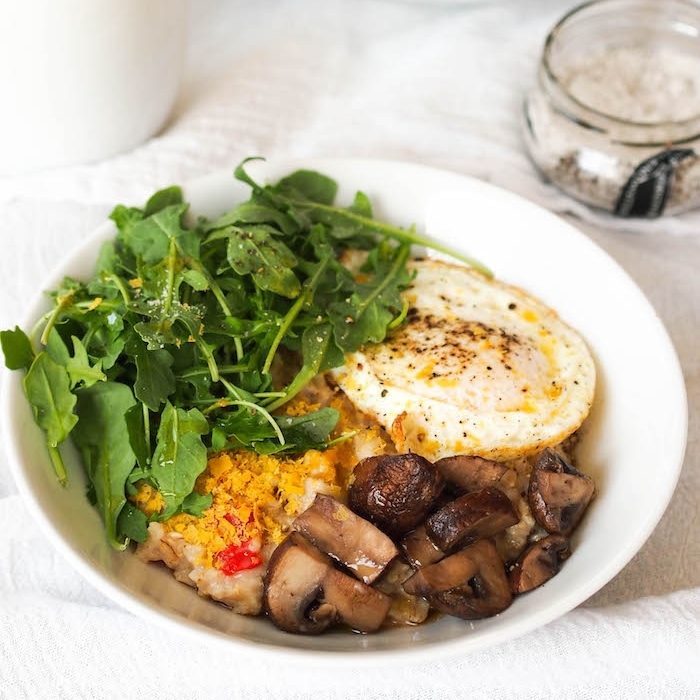 I'm especially obsessed with the steel-cut oats, which cook up extra creamy with the yummiest texture. 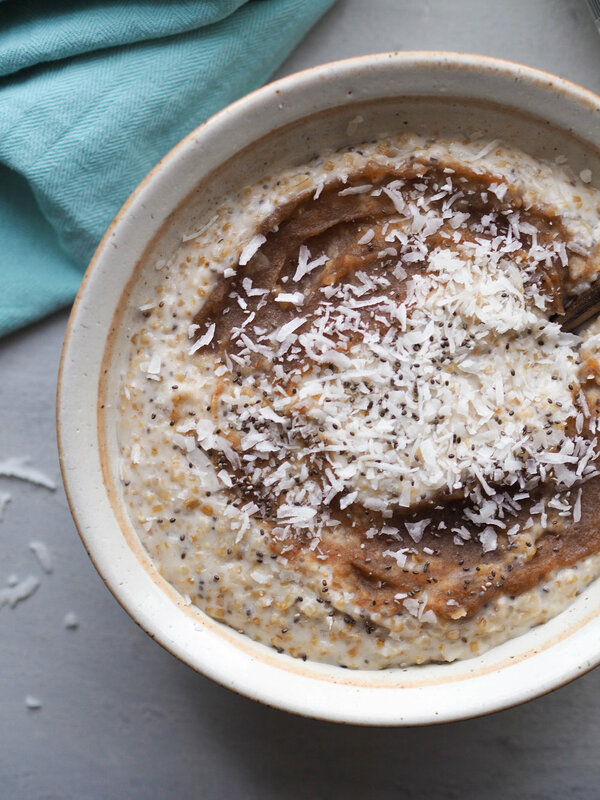 I used a combination of both steel-cut oats and Nature's Path Qi'a Superfood Oatmeal, which gives it even more delish texture. I love to cook oatmeal in coconut milk because it makes it creamy, and the fat in coconut milk makes it more satisfying. You could use either regular canned coconut milk or low fat canned coconut milk. You could also swap coconut beverage (the kind sold with soy milk and almond milk at the grocery store), but it won't be quite as creamy or filling without those delish fats. To sweeten this oatmeal, I made a quick date paste. 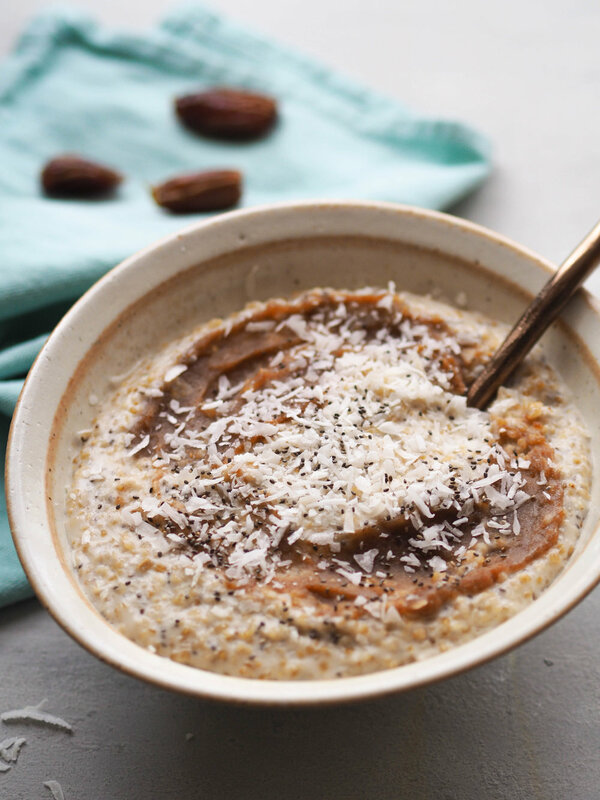 I love the caramel taste it adds, plus it makes a yummy bowl of oats without any added sugars - just the natural sweetness of dates! This recipe makes extra date paste, which you can use as a sweetener in cooking or baking, or in a peanut butter sandwich in place of jam. If you forget to soak the dates when you want to make this, just bring the dates to a boil in water and turn off the heat to soak a couple minutes - that's what I did! If you're waking up snowed in today (we're not - boo! ), then you'll especially love the warming ginger spice! Heat coconut oil in a medium pot on medium heat. Add steel-cut oats and toast for 1-2 minutes until fragrant. Add Qi'a packet, coconut milk, water and salt and bring to a boil. Reduce heat and stir in ginger, chia and vanilla. Simmer, stirring occasionally, until tender and creamy. Meanwhile, make the date paste. Drain the dates and add to the food processor with vanilla extract. Blend until pureed, streaming in about 1/4 cup reserved soaking liquid to thin (add more or less depending on desired consistency. 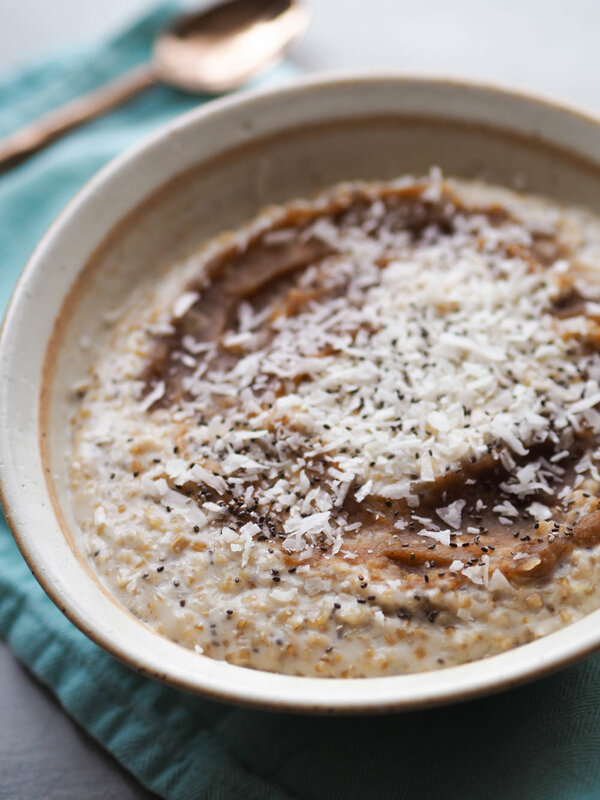 Serve oatmeal drizzled with date paste.